The Oviatt Penthouse is one of LA's true treasures! Built in 1928 and being restored to original luster it makes for a perfect venue for any intimate wedding! It is under new management which has great pride in this venues history! Truly Yours Catering is the exclusive caterer for the site and has a 26 page menu to give you the event of your dreams! Everything has been upgraded to the new Chivarri Chairs to opening the upper deck to a lounge area! We welcome the public to come enjoy the space by taking the Art Deco tour through the Los Angeles Conservancy or booking a private photo session with Top Of The Event Photography who has exclusive use of the site! The space is designed for a maximum capacity of 122 guests and is booking fast! Get a sneak peek by joining us on the rooftop for a New Year's Eve Party! And keep track of the restoration work by checking us out on Facebook under Oviatt Penthouse! Built for James Oviatt, a haberdasher whose luxurious shop once occupied the ground floor of his namesake building. Oviatt's ambition was to create a spectacular residence that would showcase the Art Deco design he'd admired at the 1925 Exposition in Paris. The Penthouse suite leads to a spacious rooftop terrace with dramatic 360-degree views of downtown Los Angeles. No insurance or security deposit is required. No additional fees. 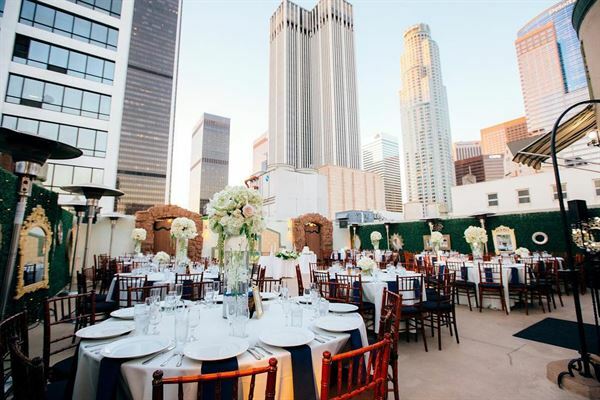 The Oviatt Penthouse in Los Angeles is a fresh and beautiful setting to hold a wedding, featuring the many skyscrapers and light of Downtown as the backdrop. Though a somewhat small venue holding up to about 120 people, the views from the outdoor portion of the penthouse are boundless. Guests will enjoy watching the sunset, dancing underneath the stars, sipping cocktails, and eating their dinners catered by Truly Yours. The Oviatt is also accustomed to meeting the needs of any themes parties for corporate events or personal parties. Truly Yours go out of their way to work with clients and provide a number of different satisfying packages to meet their needs. Each package may also come with a plethora of great bonuses such as a personalized menu, chivarri chairs, silverware, dinnerware, glassware, serving staff, and bartenders. They also have photographers on site called Top of the Event Photography to capture memories from the event. This particular menu seems to be getting more and more popular as couples and corporate offices are discovering this comfortable yet refreshingly different venue. Overall, the setting is beautiful while the staff is professional and friendly. The facilities are well kept and the overall service is wonderful.